Arriving at Bryce Canyon mid-afternoon, Dave and I headed for the short Mossy Cave Trail to get our feet wet among the majestic hoodoos. This trail actually begins outside the park at the far northern reaches, then enters the park boundary on foot. The trail is a streamside walk up to a mossy overhang and small waterfall. Mossy Cave isn’t a cavern, but is a grotto, created by an underground spring. We hiked to Mossy Cave on Saturday, June 2, 2018 beginning at 3:00PM and finishing about 4:00PM. Our plan was to explore this northern portion of Bryce Canyon National Park. Hike Rating: Easy. Mostly a streamside stroll. Limited climbing to the grotto. Trail Condition: Very good. Hard pan consistency. Possibly dusty during dry summer. Starting Point: Trailhead along Hwy 12 along the road to Tropic, UT. Trail Traffic: There were perhaps three dozen other hikers. Pretty busy. How to Get There: From Ruby’s Inn, UT take Hwy 63 to the junction with Hwy 12 and turn right. Trailhead is approximately two miles on the right. At first, as you enter the trail, this small drainage known as Water Canyon, might look like any ordinary Bryce kind of canyon. But it’s not. From 1890-1892 Mormon pioneers labored with picks and shovels to carve an irrigation canal known as the Tropic Ditch from the East Fork of the Sevier River, through the Paunsaugunt Plateau, into this canyon. Except for a severe drought in 2002, the water has flowed continuously for more than a century, and the lives of families living in and around the nearby town of Tropic still benefit from the effort of the pioneers. Soon after crossing a small rise you see the water… the pale green water. It is readily apparent that this is a mineral rich environment, simply by the color of the water in Tropic Ditch. You are surrounded by hoodoos on both sides of the canyon. Hoodoos are tall skinny spires of rock that protrude from the bottom of arid basins. They are created over many centuries through slow erosion of the soft rock and dirt sediment layers. While the hoodoos here at Mossy Cave aren’t nearly as spectacular as the ones in the heart of the national park, they were a good reminder to us of what we had to look forward to throughout this visit to Bryce. There is a small, perhaps 40 foot long foot bridge over Tropic Ditch, and then as you round a bend in the trail you see the unexpected. A waterfall. That’s the last thing I expected to see in Bryce Canyon National Park. Sure enough. Those Mormon pioneers had a playful nature apparently as they took the Tropic Ditch over a 10 foot drop in the canyon floor. The trail forks, and you can take the right fork to the waterfall. Here, the rapid trenching of the stream has been delayed by a layer of dolomite, a special form of limestone fortified by magnesium. Dolomite is not only harder than regular limestone; it also can’t be dissolved by slightly acidic rainwater. Dolomite is what has created this waterfall and it is also the cap rock for the more famous and durable hoodoos. The young kids who were also out hiking with their parents on this day made a beeline straight for the waterfall, and could be seen splashing and playing there for the duration of our visit. Take the left fork in the trail to Mossy Cave. This isn’t a cave in the walking underground sense. It’s more of a shelter cave. Here depending on the season, you will see a large overhang either filled with moss, or with giant icicles. The icicles sometimes last as late in the season as May. Mossy Cave is created by an underground spring. It was so dark and contrasty inside that I didn’t even try to get a picture. Frankly, the waterfall is a lot more interesting. The trail continues along the Tropic Ditch water course for another quarter mile or so, but the Park Service has this section closed as they work on native vegetation rehabilitation. All you’re missing out on is a chance to get a bit closer to some hoodoos. 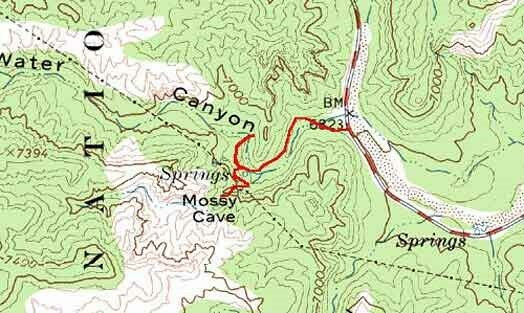 Summarizing Mossy Cave Trail, this is one that’s great for the whole family. Especially if you have little kids, they will love the small waterfall. The hiking is short and easy and a good introduction to Bryce Canyon National Park. If you’re traveling on a very limited budget, you can save some money on the national park entrance fee because this trailhead is actually located outside the park boundary.